Well, we’ve just got back from 2 glorious weeks in Botswana – a change from our usual visit to Kruger and the Klaserie. We were tempted to try somewhere new, after speaking to friends and seeing some of the fabulous photos of the world renowned Okavango Delta and Chobe National Park. Botswana is really wild – an untouched wilderness, left as it should be with no (or very little) intervention by man. 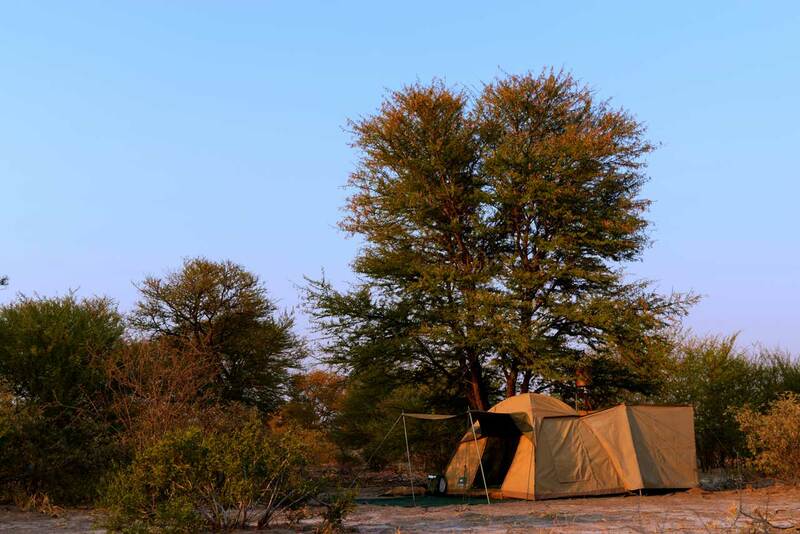 We chose to explore Botswana in true African style – on a mobile safari, camping in a 2 man tent with Afrika Ecco Safaris. We were a little apprehensive to start, seeing as we are used to luxury lodges whilst staying in the Klaserie! We didn’t need to worry – it was fabulous. We arrived in Maun, and started our adventure travelling down the Boro river in the blue waters of the Delta. After a 3 hours via speedboat, dodging hippos, lechwe and elephants on our way, we arrived at a small island (Snake Island) to our ready prepared camp. The next 2 days were spent relaxing on leisurely mokoro rides through the reed beds and open straights, experiencing the Delta at its very best. Moving slowly and silently through the water, we experienced fantastic bird life (however no elusive Pels fishing Owl), and fabulous scenery. Next, on to Moremi Game Reserve – a hair-raising travel via an open game vehicle on main roads of sand/dirt – no tarmac in sight! We arrived late at our campsite in Xinii (in the south of the park) due to getting stuck a few times in the deep sand. In Botswana, it’s not your regular campsite – no fences and no neighbours, you feel like you are the only people there. As we started to set up camp in the low light at dusk, 14 wild dogs trotted past us, one by one, about 5 metres in front of us. What a welcome! Our game viewing luck continued: cheetah with cubs, lions on a hunt, wild dogs at sunset, as well as fabulous viewing of tsessebe, zebra, lechwe, wildebeest – often just in from of our campsite. Xinii is a gem of a place, quiet and unspoilt. I’m sure in the 3 days we stayed there we only saw 2 other vehicles! Khwai, in the north of Moremi was our next stop after a day-long drive through the park. This time our campsite was situated on the edge of the Khwai river, part of the Delta. We were welcomed by 5 elephants passing through our campsite to reach the reedbeds in the river directly in front of us. Khwai is a busier part of Moremi, although we were often the only vehicle in an area at the time. The plains around the river are full of lechwe, zebra, wildebeest and elephants. Predators were a little elusive, however. Although we heard lions roaring every night, and saw their footprints every morning, they didn’t want to be seen. Savuti, in Chobe National Park, was our final destination. After a long drive from Moremi, we passed through the Mababe Depression – a large flat plain which was originally a super-lake hundreds of years ago. No photo does this place justice – there are just miles and miles of flat plains, dotted with the odd Acacia tree and termite mound! Savuti, and the famous Savuti Marsh lies at the northern end. What a fabulous place, and a predator’s paradise. In the 3 days we spent there we were lucky enough to see a pride of lions on every drive: resting in the shade, then hunting and killing a buffalo calf right in front of us. Finally we caught up with them relaxing again, by a small watering hole – this time joined by their 2 cubs. We saw a very relaxed female leopard, lying in the long grass not far from a neighbouring campsite. At this time of the year Savuti is very dry, the Marsh being a large, dry expanse, dotted with the odd herd of wildebeest, buffalo or elephant. However, after the rains (at the end of the year), this transforms to lush green heaven with thousands of Buffalo. This is a very special place and definitely our favourite place in Botswana so far. We were the only 2 guests on this adventure – with 3 members of staff. Rock, our ranger, Parks, our cook, and KD, our camp-hand. Its not luxurious, but it is definitely an adventure and the real Botswana. There is a bucket shower, filled with water boiled over an open fire, and the toilet is a hole in the ground, covered by a toilet seat. 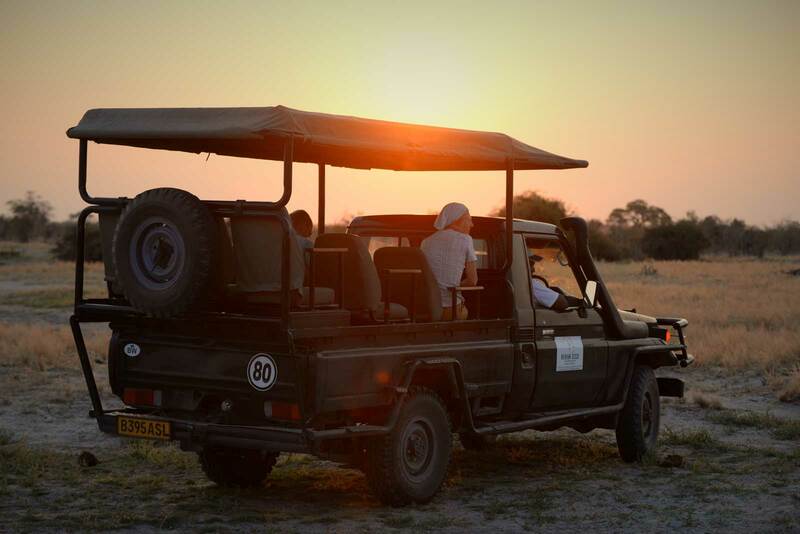 We will definitely be returning to Botswana in the future – maybe as a self drive. Chobe and Savuti being our favourite places. It would be nice to explore this breathlessly beautiful place in more detail, and maybe venture north to the Chobe river – so we’d better start saving! But in the meantime South Africa and the Klaserie are booked again for October, so back to our familiar home from home in Africa – we are already counting the days.